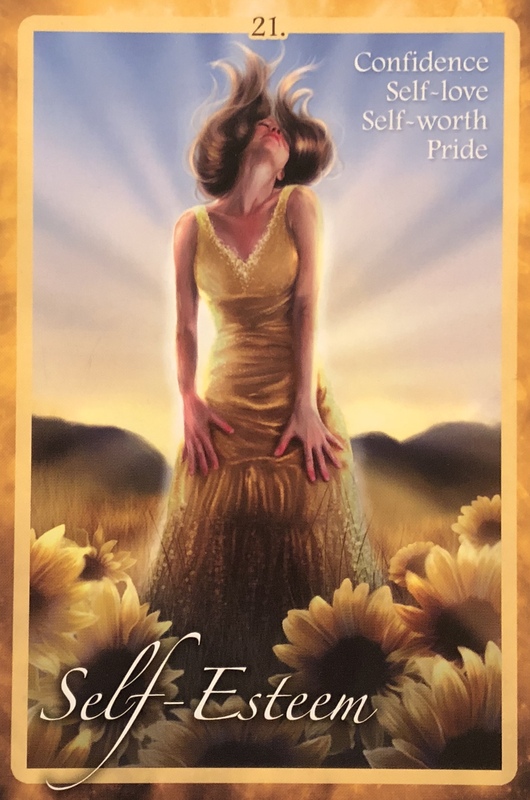 Card Message: “It is time to rise up and fully embrace the unique individual you came here to be. Follow your inner voice and feel great about being who you are – expressing yourself in simple, authentic ways. If we always seek to please others or ‘fit in’, our confidence and self-esteem will always rely upon their approval. It is time to take back your deep inner power and claim a sense of confidence in simply being you. Acknowledge your very best qualities, take pride in how you present yourself and learn to love your ‘imperfections’ as essential aspects of what make you the uniquely Divine individual that you are. This card is an invitation to discover who you are and the power within your true self. Immerse yourself in activities that increase your self-awareness and confidence. Take up a hobby or learn a new skill. Spend time among friends who see you in your highest light. Spend time in nature alone. Take fun risks, audition for a play, write a song, get your hair cut. Write down what you are grateful for, what you are good at and what you love about yourself. Spend time daily doing things that wake you up to the YOU that you really are deep inside. In a basic sense, we can build our self-esteem in simple ways by eating more nutritious foods, by exercising in ways that make us feel alive and by honouring our need for rest and rejuvenation. As we expand our energy and nourish ourselves we naturally enhance the vibration and outward expression of our being. We find ourselves feeling more alive, more connected and more excited to be exactly who we are. This is one of the most challenging things we face in our lifetimes. Being truly happy with who we are; where we are at; in the body that we are in. Particularly for females but I know it affects males too. Finding our place in the Universe. Believing in ourselves and seeing our gifts, talents, strengths and weaknesses and loving ourselves not despite of them, but because of them all. Complete acceptance. It’s ok to be a work in progress. But it is not ok to put your life on hold until…. until that special someone comes to rescue you and give you the love and approval you feel you need in order to be accepted… until you lose weight; have a certain job or amount of money or material object; or until you fit into a certain group or social circle. Or until whatever really. We put our lives on hold thinking that we should put the “until” in front of the happiness. But we’ve got it all backwards. Be happy first. Despite it all. Acknowledge where you are at and how you got there and then know you have the power to change it all. Accept full responsibility for the creation of it all. And the absolute truth that you are also responsible for the creation of something different or better or brand new. No more sitting around waiting for things to happen. Waiting for the body to co-operate. Waiting for the finances to increase. Waiting for Mr Right to show up at the door. (dammit… you mean Thor is not going to show up in my living room?) Ok… well do leave some wiggle room for Miracles and blessings and surprises of course. But be happy anyway. Love the you that you have created and love what comes next. That’s where your power lies. I love the message! It’s exactly what I needed to hear today, and I will follow this wise guidance. The accompanying picture, however, reinforces stereotypes that only white, blonde, slim yet big-boobed women are beautiful (which is detrimental to our self-esteem.) We are all beautiful! Would love to see more women of colour, of age and maturity, in all our varied and wondrous goddess-like shapes and sizes. But love the message, as always! Very well-written and inspiring.